Many state public utility commissions (PUCs) have started to require electric utilities to consider environmental and other externalities in their planning processes. To date social costing has been applied exclusively to the evaluation of new sources of electricity. More comprehensive approaches to social costing would include requiring the utility to dispatch both new and existing generating units according to social cost, or requiring electricity consumers to pay a price for electricity that reflects its full social cost. Using estimates of external costs taken from the literature, this study contrasts the implications of these three different approaches for utility decision making, electricity prices, demand for electricity and other fuels and the net emissions of selected pollutants for a Maryland utility. We find that applying social costing at the investment stage only may lead to reduced investment in new resources, increased use of existing generation resources and higher emissions of key pollutants. Applying social costing to dispatch generally leads to increased levels of investment in clean technologies, lower levels of emissions and only moderate price increases. Also, social costing of electricity generally has a small impact on consumer demand for natural gas. This study examines the residential demand for electricity by time-of-use in Switzerland. For this purpose, an almost ideal demand system (AIDS) model for peak and off-peak electricity consumption is estimated using panel data coveting the years 1987 to 1990 and 21 cities. The empirical analysis characterizes the Swiss residential electricity market as rather price responsive. The own partial price elasticities are estimated to range between -1.29 and -1.50 during the peak period and between -2.36 and -2.42 during the off-peak period. These elasticities show a high responsiveness of electricity consumption to changes in peak and off-peak prices. Moreover, the positive values of the partial cross price elasticities and substitution elasticities show that peak and offpeak electricity are substitutes. Insulation reduces marginal heating cost and may lead to a takeback effect of higher wintertime thermostat settings, with a consequent dilution of energy savings. Alternatively, additional insulation could permit a lower thermostat setting by reducing drafts and radiation while increasing moisture retention, thereby enhancing comfort. This paper evaluates thermostat net takeback, the difference between takeback and enhanced comfort. Evidence supports the existence of both effects, with net takeback at the low end of literature estimates. Net thermostat takeback is on the order of 0.05 degrees F, leading to an energy takeback that ranges from 1-3% of potential energy savings, depending on climate and house size. Other significant determinants of thermostat are heating energy price and the presence of elderly or young occupants. Residential customers' choice of efficiency level for appliances, and their participation in demand-side management (DSM) programs, are examined using data on customers' stated preferences in hypothetical (i.e., conjoint-type) situations and their revealed preferences in real-world choices. The analysis provides information on customers' willingness to pay for energy savings, the importance of rebates in customers' decisions, and customers' response to DSM programs that offer loans for purchases of high-efficiency appliances. An estimated model is used to forecast the decisions of customers under: higher rebates, replacement of rebates with finance programs, offering of loans and rebates as alternative options for customers, and the elimination of DSM programs. We find that attractive loans (e.g., low interest rates, long repayment periods) are necessary to have the same effect as rebates. Programs that offer customers the option of loans or rebates are found to be far more effective than programs that offer only loans or only rebates. This research tests a form of the efficient markets hypothesis in the, market for natural gas futures. Unlike other studies of futures markets, the test for market efficiency is conducted at numerous locations which comprise the, natural gas spot market in addition to the delivery location specified in the futures contract. Natural gas spot and futures prices are found to be nonstationary and accordingly are modeled using recently developed maximum likelihood cointegration techniques. The futures market price is found to be cointegrated with nearly all of the spot market prices across the national network of gas pipelines. The hypothesis of market efficiency can be rejected in 3 of the 13 spot markets examined. 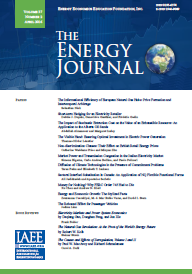 This paper uses a numerical model to examine the long-run impact of a radical liberalization of the West-European natural gas markets. We study profit maximizing Cournot producers facing an ideal third party access regime for gas transport. Producers sell gas either to large users in the manufacturing industry and to gas-fired thermal power plants, or to local distribution companies. We first examine the case where no traders exploit arbitrage possibilities and some producers have limited access to the markets. In this equilibrium net prices differ across markets. These differences disappear in the second case where traders are introduced. The third case focuses on a complete European market for natural gas in which traders exploit all arbitrage possibilities and all producers can sell gas in all markets. We also study the impact on the complete European market of changes in costs for production, transport, and distribution. Finally, welfare implications from a liberalization of the West-European natural gas markets are discussed. We argue that a radical liberalization could increase economic welfare in Western Europe by 15% to 20% in the long run. Accurate information on geology, petroleum engineering, and economics is essential for firms to make efficient decisions concerning if and, if so, how to produce natural gas wells. Improved information may not only help insure that wells are economic, but may also lead to reduced costs of production and an increased physically recoverable stock of the resource. This paper empirically applies the economic theory of exhaustible resources (extended to include necessary reservoir engineering) to evaluate the benefits obtainable from using an enhanced information technology developed by the Gas Research Institute. The wells analyzed indicate significant benefits are obtainable with appropriate use of the new technology. The magnitudes of these benefits vary across reservoir characteristics.